AMD is launching a new game bundle today that's a little different from the company's standard promotions. 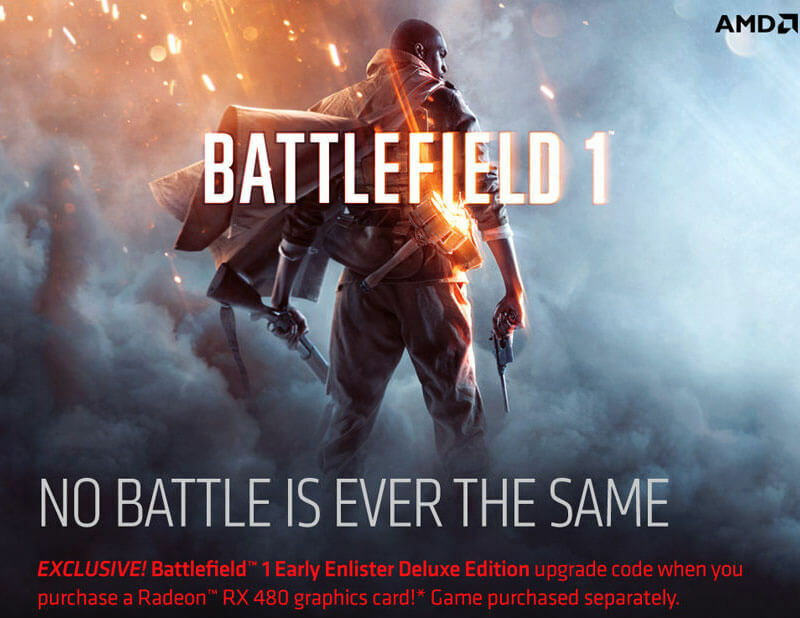 Buyers who purchase an AMD Radeon RX 480 in select markets will get an upgrade code for Battlefield 1, transforming a Standard Edition of the game to the Deluxe Edition. To be clear, AMD is not bundling game codes for Battlefield 1 with RX 480 purchases: you'll still need to buy the game separately, as this bundled code merely upgrades the cheapest edition to the Deluxe Edition. The difference in price between these editions is $20 through EA's Origin service. If you redeem the code before October 21st, your copy of Battlefield 1 will be upgraded to the Early Enlister Deluxe Edition, which gives you three days of early pre-launch access to the game. Using the code after October 21st still gives you the Deluxe Edition, although as the game is launching on that date, there's no longer any time to give pre-launch access. Aside from early access to the game, the Deluxe Edition includes the Hellfighter Pack, Red Baron Pack, and Lawrence of Arabia Pack, which all unlock various themed items in the game. There's also a further three vehicle skins and five battlepacks. Future DLC is not included in the Deluxe Edition; you'll have to purchase the Collector's Edition to get the season pass. This promotion runs from now until October 18th, so it might be time to purchase a Radeon RX 480 if you're also interested in Battlefield 1. Like previous game bundles, not every retailer participates, so make sure your favorite store is giving out codes before clicking 'buy'.